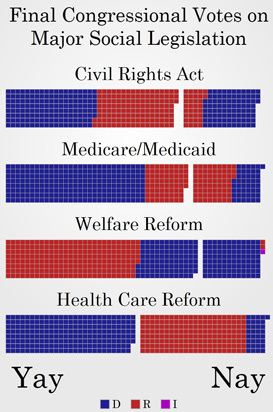 Can You Spot The Partisan Legislation? 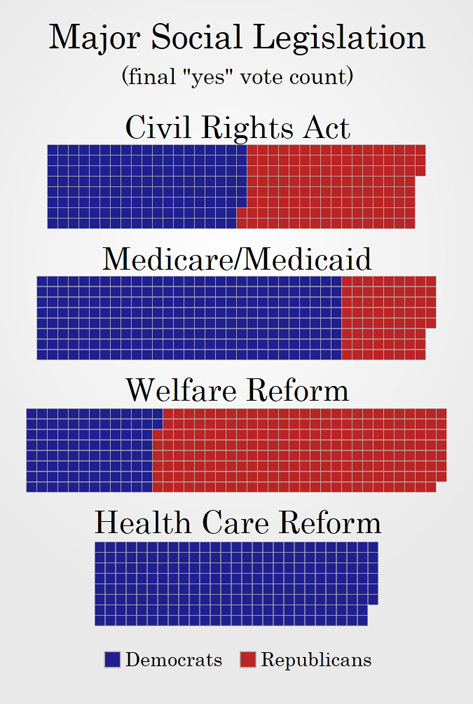 UPDATE: I discuss the issue of partisanship and health care reform more here. You may or may not know that one of the more entertaining themes running around the media these days is that the almost entirely Democratic passage of the health care reform bill is pretty standard issue for major social legislation. 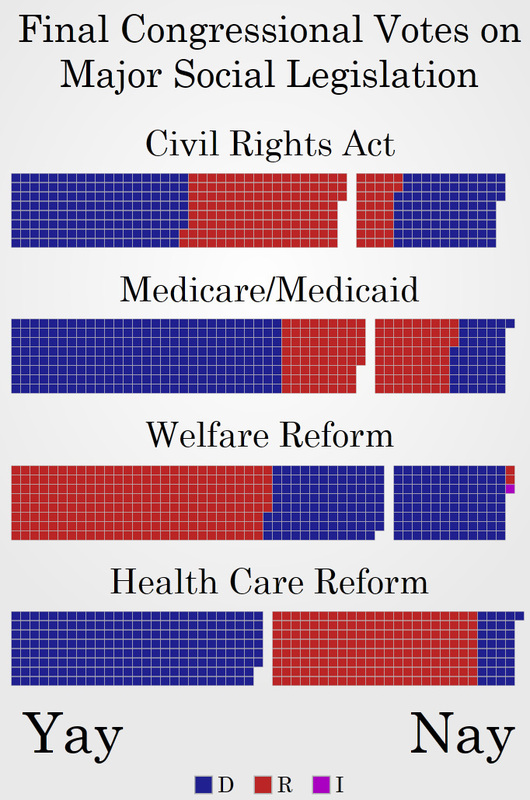 After all, the theory goes, Republicans never really supported any major social legislation and this bill was about as bi-partisan as it could get under the circumstances. I try so very hard to stay out of name calling on this blog. But hearing people repeat this line is like hearing people talk about that alien they saw. Or, rather, they know this one guy who saw one and he was totally trustworthy. OK, maybe they didn’t so much know that guy, but a guy they know knew that guy and could get you in contact with him if they hadn’t lost his number. Perhaps the aliens stole it off his phone. We live in a world of accessible information. Quite frankly, if you’re too lazy to go look up the damn facts your own damn self you should probably make it a practice of just keeping your mouth shut. So when I hear people saying that this kind of narrow, one-party passage of major social legislation is par for the course, I look it up for myself. Guess what I found? Hint: Those people don’t check Wikipedia. Download the large version, the medium version (seen above) or the small version. By request I also have a version with the Yay and Nay votes together. Download the large version, the medium version or the small version (seen above). 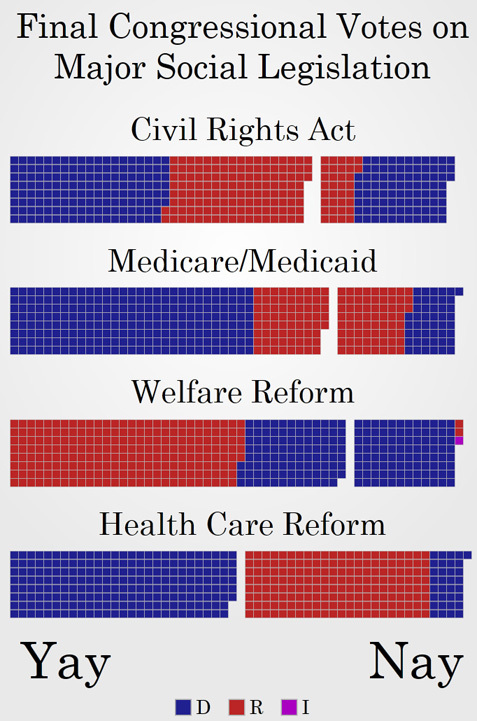 The point I’m trying to make here is that this level of partisanship for such huge legislation is, based on my quick sampling, pretty rare. Look at the Iraq war, Social Security, No Child Left Behind, even the 1994 assault weapons ban saw pretty massive aisle crossing. The funniest thing about health care reform is this: Not only was the the “yes” vote highly partisan, the “no” vote was actually somewhat bi-partisan. Nearly a fifth of the people who voted against health care reform were Democrats. So the “Republican” side of the issue managed to convince a number on the “Democrat” side, but the Democrats convinced exactly zero Republicans. The reason I’m so riled up about this is because Jim Lehrer, whom I like and respect, basically accused the Republicans of having a history of short term opposition on social legislation. Is that going to happen with health care reform? UPDATE: A commenter below has graciously provided a link to the full transcript here. Thankfully, Senator Kyl took him to task over that statement, but what would posses a journalist to make such an inaccurate statement? I’m going to go ahead and chalk it up to Lehrer simply not having the facts and not bothering to find out about them. He assumed that Republicans opposed that legislation because… um… I guess because Republicans are poopy doo-doo head who poo in their pants. Or something. I would love to educate Mr. Lehrer and help him educate his viewers. If you’d like to help me with this, you can download one of the images above or use a link to this post and send it to the complaints department at PBS NewsHour. Please be polite. I’d rather not be represented by rude people. Data is neat. Visualizations are neat. But oh, interpretation is a messy thing. Should you be blaming Democrats for creating legislation that can’t appeal to Republicans, or should you blame Republicans for voting party line? In other words, math isn’t politics. Poor form to give out someone else’s email address on a website that doesn’t have the guts to display the author’s email address. Do you have a pie chart for that? Didn’t check the About page, did you? My e-mail address is right there. But thank you for showing your commitment to full investigation of the facts. I’ll take that into account in your comments. You have really a attention very own posting style and provide very info. The articles are fantastic to go through and you don´t use great deal ads like all of the other bloggers. The real eternal beauty resides deep inside skin. The passing of time, however, brews its corrupting effects on the skin and you’re simply left with a wrinkly appearance. Do you sometimes wish that, with just a wriggle from the nose, you obtain back your son or daughter like soft and supple skin? Well, there won’t be anyone approaching to you personally having a elixir of youth but that does not imply that you should accept a dull aging skin. All the deep dreadful aging signs are effectively eliminated while using the Juveneua great skin revival cream that you should revitalize and rejuvenate the actual skin. Aging for girls may not be an attractive phenomenon, which is pretty an all-natural feeling as all the wrinkles, fines lines and sagginess start to come up with your skin while using progressing age. Therefore, women are always buying effective and safe cure to smoothen out all of the skin imperfections and flaunt a company flawless skin. As well as in this hunt for a timeless beauty, a great wrinkle lifting option is everything it is possible to gift the skin for restoring its juvenility. The very best certainly nothing nevertheless the best healthy skin care ingredients are contained within each pack of your amazing wrinkle reducing serum. Matrixyl3000 is actually a powerful formula that repairs all of the damage due to getting older. It works by renewing the many skin cells afresh as well as activates the cell proliferation procedure that becomes weaker and weaker since your age advances. For girls who will be classy enough to demand only the most beneficial, why be satisfied a skin that is something lower than just perfect. Have yourself this unique wrinkle cream on the official website of Revivagenix and seal the skin that has a youthful glow. Great post. I personally wish flash participant 2010 was the normal as I hate all of the new updates. How do you think the new versions of flash player evaluate to flash player 2010? I was reading through about Flash Player 2010 and definately continues to be my preference.